If you are one of the millions of homeowners who have purchased a Doughboy Swimming Pool, then you are one of the lucky ones. Doughboy Swimming Pools are one of the top swimming pool companies in the industry. The company has been in business for over 60 years. They have quality swimming pools that are built to last. Doughboy Pools is actually the very first company to introduce the Portable Swimming Pool. There may come a time when you may need to upgrade some of the things on your swimming pool. The liner is just one of them. Finding a liner can be a frustrating thing but when you have a Doughboy the experience could be more pleasant. Did you know that Doughboy is the only above ground swimming pool manufacturer that is the main creator of the Virgin Vinyl Liner Material? Let’s take a look at some of the choices you will have when replacing your swimming pool liner. As we mentioned Doughboy is the main manufacturer of the Virgin Vinyl Material. This material is made with the Therma-Seal Technology, this method offers a high quality sealing that makes the liners more durable and made to last longer than other swimming pool liners. With the Virgin Vinyl you can be guaranteed that your liner will not be made of any reprocessed materials. The Virgin Vinyl is UV protected so it will not fade or crack in the summer sun. These liners are soft, flexible and have a thickness that your swimming pool liner needs. Doughboy offers their E-Z Clip Liners, these liners are available only through Doughboy and they are designed with a custom liner receiver and a liner pattern that will create the swimming pool of your dreams. Doughboy offers a 25 year 3/100 Warranty and the Seam has a 100% Lifetime Warranty. The E-Z Clip Liners are available in 5 different designs, the Madrid, Mayan, Solid Blue, Misty Falls and Evening Star. The Overlap Liners are full patterned designs with printed bottoms. There are 8 great designs that include Blue Bayou, Angle Falls, Reflections and the designs we mentioned for the E-Z Clips. Overlap Liners have 20,25 or 30 year Warranty. All of the Doughboy Liners come in either a 20 or 25 Mil. 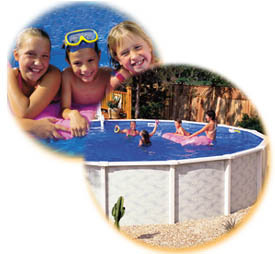 The AQUALINER Above Ground Vinyl Liners are a great fit for Doughboy Swimming Pools. They offer new contemporary patterns that will fit all shapes and sizes of Doughboy Swimming Pools. The AQUALINERS are expandable Liners that are made with 20 Gauge materials. Expandable Pool Liners are a stretchable material most commonly vinyl. This style of liner is used to accommodate all size swimming pools. These liners are made to fit 72 inches deep, you may know these liners as stretch to fit liners. There are 8 different designs in the AQUALINER, the Classic, Chateau, Capri, Blue Stone Mystic and Solid Blue just to name a few. AQUALINERS are perfect for Doughboy Swimming Pools because they are made with the highest grade UV resistors that will protect the liner from weather, sunlight and swimming pool chemicals. 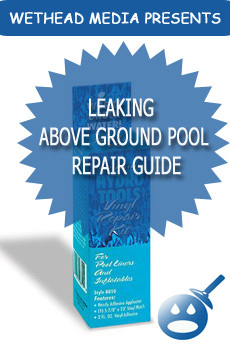 Each swimming pool liner has a long lasting 1/2″ strong seam. If you can’t make up your mind about a swimming pool liner for your Doughboy Swimming Pool, try Garrett Swimming Pool Liners. Garrett has been manufacturing above ground swimming pool liners since 1964. Garrett has a wide variety of colors and patterns to choose from. The great thing about Garrett Liners is that they accommodate most above ground swimming pools including Doughboy. All Garrett Liners are made with USA or Canadian Virgin Vinyl, these liners are made to last. They are available in Tuffside 28/20 mil, Superlines are all 28 mil and all others are 20 mil. Garrett has some great designs ranging from Hamilton Tile Cobblestone, Tropical Tile Mosaic and Oasis Tile Mirage just to name a few. When you have a Doughboy Swimming Pool you know you are getting the very best in swimming pools. Over time, some liners will wear and some will tear and you will have to replace it. You should feel better knowing that with a Doughboy Swimming Pool that your choices are plentiful. 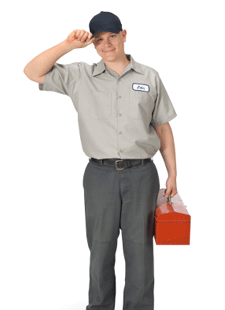 The companies we mentioned, Doughboy, AQUALINER and Garrett are all great liner companies. Each company has some really great styles and designs waiting for you. When you are in need of a liner for your Doughboy pool, the only question you may have is which company and which style of liner do I choose? Each company is qualified to bring you long lasting, durable and UV protected swimming pool liners. The choice is yours. I have a doughboy pool, measuring 16 ft x 28 ft x 48 inches and I am looking for an overlap replacement liner. Can you help? I need a new DoughBoy liner with the E-Z clips; my pool is oval, 18×33. Can you please send me pricing info? I need a DoughBoy liner with the E-Z clips; my pool is oval, 12×20. Can you please send me pricing info on DoughBoy and comparable liners? There are product named tretch-to-fit liners. 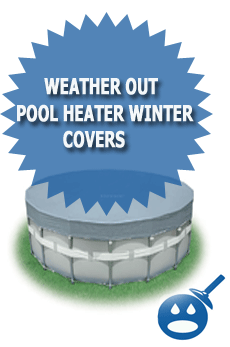 These liners will fit up to a 72″ deep pool with no problem. People use them for replacing Doughboy expandable pool liners. The unit price is $266.99, so the total cost would be around $300 with est. tax & shipping. Wow, awesome weblog layout! How long have you been blogging for? You made blogging glance easy. The overall look of your web site is fantastic, as well as the content material! I need a liner for a 32 foot above ground doughboy pool. I can’t seem to find a 32 ft. I find 30 and 33 foot liners. Can anyone help me? Hello, Maeka. Have you tried the manufacturer directly? Either go to doughboy-pools.com or Doughboy Recreational at 866-DOUGHBOY and they should be able to guide you through.. I am looking at replacing our liner to our doughboy 24′ round,52 deep, non-expandable liner, overlap. Is there anything comparable/sturdy to doughboy liners that aren’t an arm and leg?